Do you dread laundry day? Taking time out of your week to clean your clothes can be an annoyance, but it’s necessary. 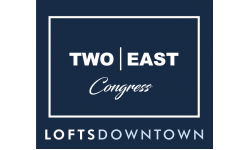 In this week’s Two East Congress Blog, we’ve decided to share with you some tips to make your laundry day a little easier! These tips may not remove the chore of doing laundry, but at least you’ll be able to make better use of your time! If you’re a busy person, you’ll want to take advantage of the time you have between washing and drying your clothes. Set an alarm so you know exactly when you should switch your clothes over to the other machines or remove them from the dryer. If you’re busy doing something else, it’s easy to forget that you’ve got laundry in the machine. Without an alarm, you may end up leaving your damp clothes in the washing machine, which increases the chance of your clothes developing a musty smell that may require an additional wash to remove. Set an alarm and avoid that altogether! Washing machines can hold a lot of clothes, but that doesn’t mean you should fill it to the brim. It’s normal to want to stuff the machine full to save time while doing laundry, but overstuffing can lead to a bad wash. Instead of shoving everything in at one time, sort your clothing into your whites, your darks, and the coloreds. Wash them each separately to avoid any color bleeding and to ensure that your whites remain white, your darks remain dark, and your colors remain vibrant! Sometimes less is more, especially when it comes to laundry. Many people wait until they’ve accumulated a large amount of dirty laundry before washing them. If you were to take some time a couple times a week to do smaller loads of dirty clothes, it will take less time per day and you won’t be left with the temptation of overstuffing your washing machine! Share your laundry tips with our Tucson, AZ apartment community by leaving a comment!